There's been quite some hype and questions this summer around a new collectable (kinda) card game from Fantasy Flight Games and Magic maestro Richard Garfield. Well, now that KeyForge finally has arrived, here is the question du jour: is KeyForge fun and worth your money and/or valuable gaming time? (Spoiler: yes.) Let's dive in! 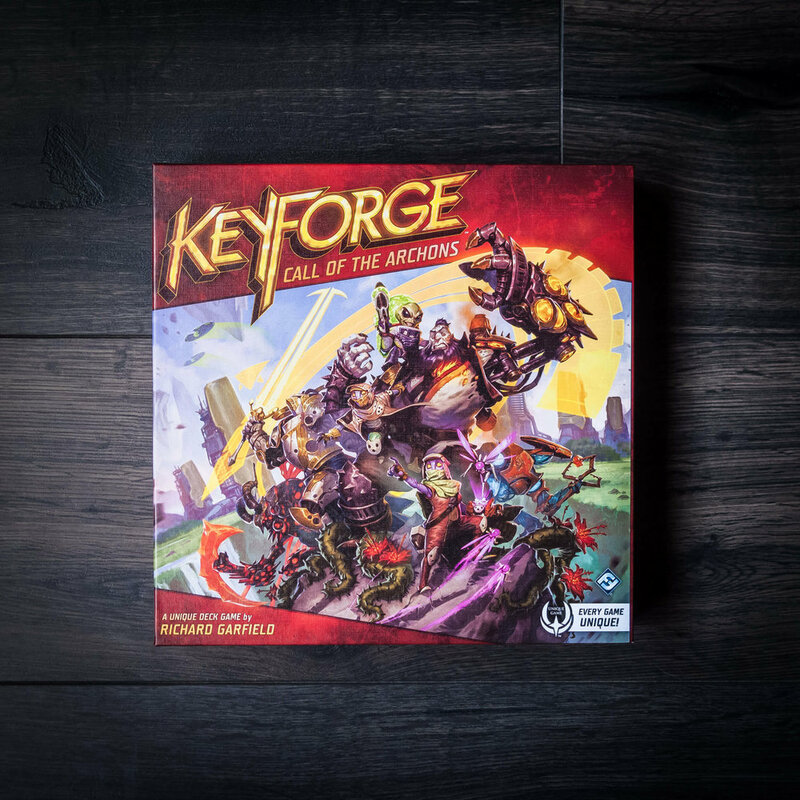 KeyForge is a two-player card deck-based battle game; players are Archons trying to be the first to "construct" three Keys. To construct a Key, players must spend 6 Æmber tokens at the start of their turn. Æmber is obtained through playing or exhausting cards that generate Æmber, or by stealing from an opponent. Pretty simple, right? Well... you and your opponent each have an Archon deck that contains a powerful set of creatures, artifacts, and action cards to thwart each other's progress. So, yeah, a fight is on. Making those keys is not going to be a cakewalk. So what makes KeyForge special, other than designer pedigree? Each players' Archon deck is unique. When I mean unique, I don't just mean the sealed decks have different cards. I mean no other deck printed has the same card combinations, Archon name, or even card back design. The Archon's name is even printed on the front of every card. This means that decks are locked; they cannot be modified, added to, or built from scratch. You buy a deck, and that is the deck: no blind booster packs; no monthly card packs, no net-decking (building card decks by researching combos online), and no chasing pricey rare cards. The names and designs of the Archons are procedurally generated, a technique common in designing video game environments, but I've never heard of it being used in a card game before. Also, the cards in a particular deck are not randomized, but sorted algorithmically to ensure a playable deck. 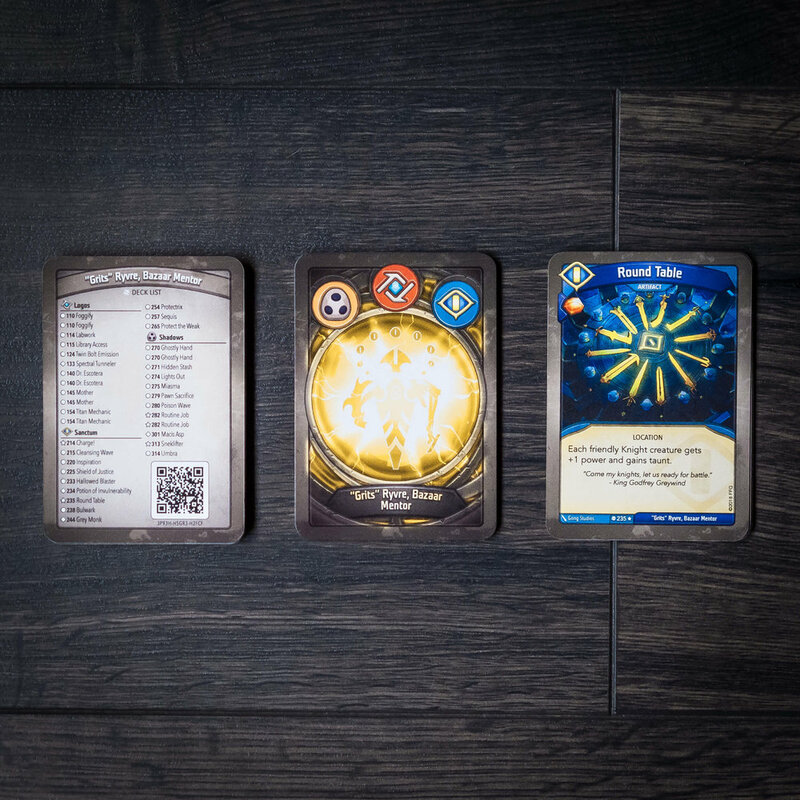 In the Call of the Archons starter set, you'll find two training decks (these are the same in every box), two Unique Game™ decks in retail packaging, power & status cards, chain trackers, six Key tokens, Æmber tokens, damage tokens, and a folded one-sheet quick-start guide. I'm not sure why the full rulebook was not included (it can be downloaded here), likely to keep it as an living document to update as needed. Everything about this box seems geared towards quickly getting you at the table and playing with no mess or fuss. The starter set is nice and complete for the $40 MSRP, but if you really want to get in the game and don't want the training decks, your minimum entry is two 37-card Archon decks for $10 a pop. For all the other content (Æmber and damage tokens, status cards) you can probably scrounge up substitutes around the house. That'll save you about 20 bucks. How do you play KeyForge? To begin the game, each player takes three key tokens with the unforged side up, places their Archon identity card in front of them, and draws six cards into their hand if they are the first player, seven if they are the second. Players may take one mulligan, drawing one fewer card, if they wish. The first phase of a player's turn is checking their Æmber pool. If they have at least six, they must spend it and flip one of their Key tokens over to forge. The color of the Key token doesn't matter, although I suspect it will in future card sets. At the beginning of the game, this phase will be skipped. The player will then select one of three houses indicated on their Archon's card. 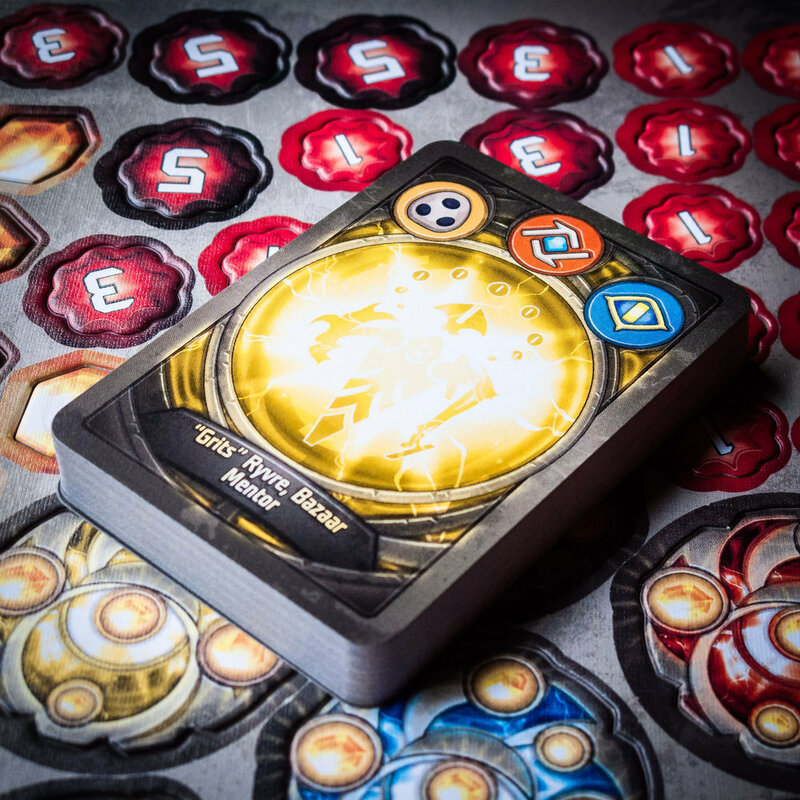 Like the mana colors of Magic, or the factions/corporations of Netrunner, each of KeyForge's seven houses has their own flavor and play style for you to discover. After picking a house, the active player may play ANY card from their hand that belongs to that house. If this is the first turn for the first player, they may only play one card this round. Cards have no cost to play. Creatures and Artifacts are permanents, they stay in play until removed by an effect or combat, and enter play on their side ("exhausted") and can't be used until turned right side up ("ready"). Action cards have an immediate effect and go into their controller's discard pile. Upgrades attach to a Creature to enhance their abilities or power. Creatures are setup in a "battleline,” meaning that the relative position of creatures on the table is important for certain card effects. When a creatures is added, they must flank one previously played. When one is removed and discarded, the remaining creatures fill in the empty spot. A player may attack with any active-house character card that isn't exhausted. Unlike other duel card games, you are not trying to take out your opponent; you target your opponents creatures instead. Each creature has a power rating telling you how much damage they can dish out and take. Also, each will have a shield rating that will absorb points of damage on every attack. Damage is persistent; creatures do not heal at the end of the turn, so damage tokens are used to track when a creature is hurting. Any ready active-house character may also “reap” for Æmber, meaning they can exhaust themselves to add 1 Æmber to their controller's pool (stored on the Archon identity card). Also, a player may discard any number of active-house cards in their hand to free up space for the draw phase. When a player is finished playing cards and discarding unwanted cards, they now ready any exhausted cards, then drawing back up to 6 cards, if needed. If they have 6 or more Æmber in their pool, they must announce "Check!" indicating that they are able to forge a key at the beginning of their next turn. It's now the next player's turn. Play continues until someone forges their third key, which makes them the immediate winner. Grits’ deck list on the left & card back in the middle - note that Grits’ name is printed on the front of the Round Table artifact card. Here's one of my Archon decks: "Grits" Ryvre, Bazaar Mentor. Every deck will have a complete card list on the back of the Archon card, along with a QR code. used for the Master Vault web portal/app and for tournaments. All a judge or event coordinator has to do is scan the code and the deck's name and content are checked in to the tournament. At least, that is my understanding of the intent. The Master Vault site and app allow you to track your decks stats: wins, losses, chains, et al. Just signup with an Asmodee.net account, login, scan the QR code or enter in the alphanumeric code, and your decks are stored. What questions come up about KeyForge? A big question that tends to come up while discussing KeyForge is deck balance. In casual play, I don't think it will be a huge issue (you can use Chains, described below), but for tournament play? Could someone have a deck with killer card combos that can blow everyone else out of the water? How do you determine if its the deck that is overpowered, or if the player is just that good? These are questions that I'm sure the folks designing tournament play are working on answering. But as of this writing, I haven't seen concrete solutions. There is an optional handicap system for casual play, Chains, that levels out a game if players perceive one deck to be more powerful than the another. It works like a tracking system where the stronger deck draws fewer cards when refilling their hand than the player with the weaker deck for a certain amount of rounds. Also, trading decks between matches is encouraged, too. Other questions are about the printing process of KeyForge. How did Fantasy Flight print tens of thousands of unique Archon decks? The publisher is tight-lipped at the moment on the exact procedure, likely because it involves intellectual property, trade secrets, NDAs, secret memos, and all that. The box says that the cards are printed in Germany. In a recent Game Boy Geek interview, Garfield confirmed that Cartamundi printed the cards. I will guess that the actual print production is the easy part of the process. Using a traditional offset press would be completely impractical, as they are designed to make a large amount of high-quality impressions of a single image. A full-color offset press typically uses four inks: cyan, yellow, magenta, and black (CMYK). Each ink is applied separately using an etched metal plate that transfers (or "offsets") ink to a rubber blanket, which then applies the captured ink to the print surface. Here's a video on the process. Because of the setup time, prepress work, and production of the metal plates, it isn't cost effective to do low print runs on an offset press, much less a single run. However, the latest high-speed sheet-fed digital presses like the HP Indigo 12000 would be more than up to the task of producing all the unique decks needed for the game. Digital presses do not need plates or offset blankets to make impressions, so they are not limited to a single image on a print run. Not only can the Indigo print quickly, but with the resolution and quality needed for a hobby gaming product. One sheet would contain all 37 cards of one deck; the Indigo 12000 can print about 1700 full-color double-sided sheets per hour. Adding press checks, maintenance, and rendering time, it seems very possible that 10,000 unique decks could be printed, cut, and packaged in just a few days. This is all speculative on my part, of course, but the point is that KeyForge likely takes advantage of the latest and greatest in digital print-on-demand technology that didn't exist until a few years ago. Now, the hard part: designing the game in conjunction with building print files for the press. I'm sure having someone around who earned a PhD in mathematics and combinatorics would be really handy... and, well, you know, Garfield happens to be one. I can't imagine the work of play-testing all the hundreds of cards, building the algorithm to sort and create the Archon decks, and creating press-ready files. This is all out of my wheelhouse here and makes my brain hurt thinking about it. But the Fantasy Flight team pulled it off, and, with only a minor hiccup, it seems to work out well so far. I really enjoy KeyForge. It's got a quick-action feel like Hearthstone or Epic. I like that its a turnkey game; you can buy a deck, sit down, and play without the subjective meta-baggage of Magic. It's not as convoluted to teach like Netrunner. As time goes on, I'll be having fun learning about the houses and discovering which ones match my play style. The cost of entry is great. Since this is a Fantasy Flight joint, you can be assured that there will be further card sets released in the future, but, if they stay with the release model of Call of the Archons (a starter set & unique Archon decks), keeping up with the game seems like a minimal investment compared to CCGs, or even Fantasy Flight's Living Card Game (LCG) model that releases new card packs every month or so for $15. Keyforge may have replaced Netrunner (RIP) for me. Any card game designed by Dr. Garfield is going to have to deal with the big ol' Magic elephant in the room. I'll just say it: KeyForge is not Magic. In fact, the beauty of KeyForge is that is purposefully trying not to be Magic, and feels like it wants no part of a comparison. But it's gonna happen, folks. I've been doing myself it in this post. So I can see this game not being everyone's cup of tea. The lack of deck-building will be attractive to some, but will be a non-starter for others. The thing that made Magic last over 25 years was not just a steady supply of expansion sets and products, but the community that developed around the game-outside-the game. The metagame of KeyForge will be interesting to watch. The pay-to-win aspect of Magic may be minimized in KeyForge, but there is still that question of potentially powerful decks on the secondary market for big bucks creeps in. How the OP team addresses this will be a big factor in tournament play. 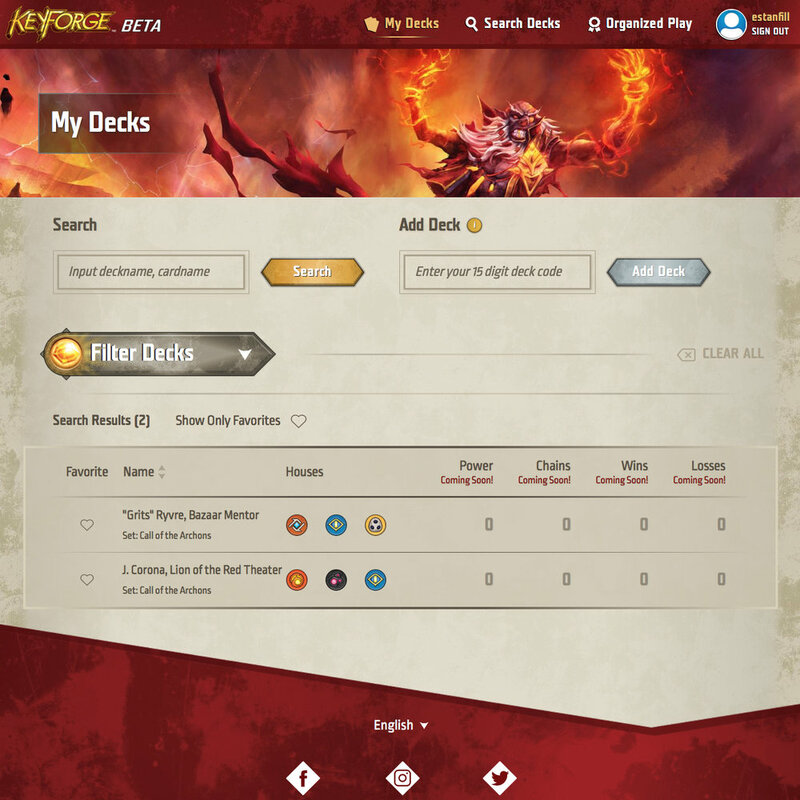 Even all this talk about tournament play, deck tracking, and other stuff, KeyForge appears designed for the casual gamer. A CCG for people who don't like CCGs. I think that's a good thing. 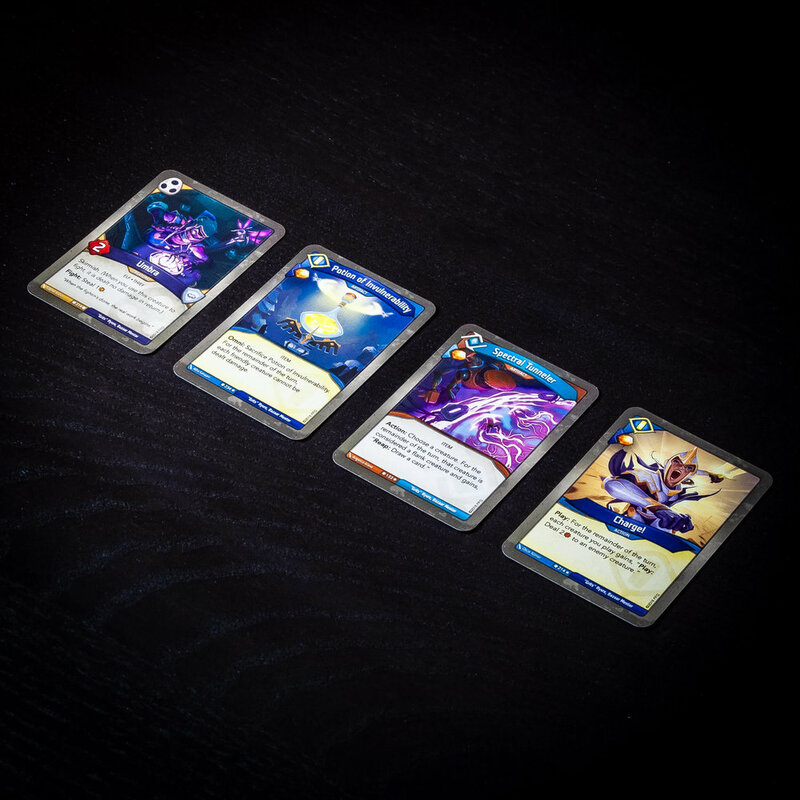 While I doubt it will reach the heights of what made Dr. Garfield famous (I don't expect any other card game will), Keyforge: Call of the Archons is one heck of a followup, and well worth anyone's time to check out.